Sandwich is considered as a very popular snack in all over the world. But they are totally different in texture or tastewise in different places. Indian sandwiches are spicy in taste. Indian sandwiches have many varities such as, vegetable sandwich, potato sandwich, chicken sandwich, fish sandwich, paneer sandwich etc. This is spicy potato sandwich . This sandwiches are easy to carry and very tasty. Kids love them very much in their tiffin box. Chicken Sandwich is a typically a boneless, skinless, breast of chicken in a bun or between two slices of bread. Chicken sandwich has many version all over the world. 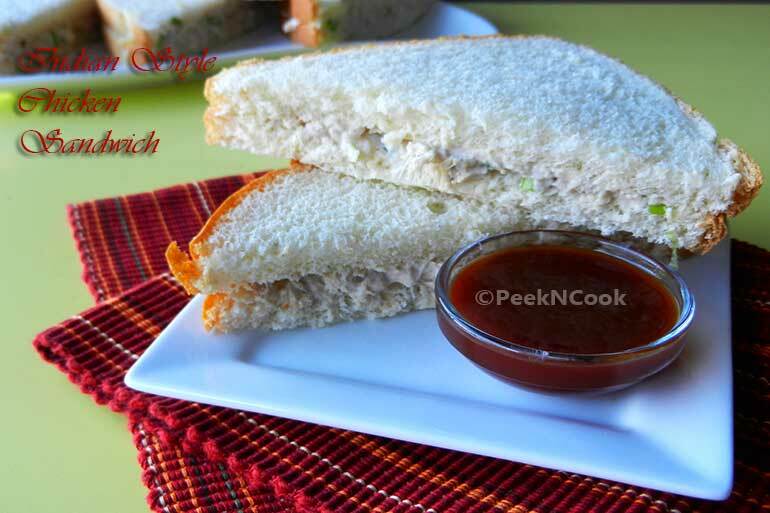 In Indian this sandwich is made with bobeless chicken, cream, mayoneise, chopped lettuce or cabbage & srping onion. This Indian version of chicken sandwich tastes so good no one can resists to have the taste. I am going to share the Indian style chicken sandwich with you. Chicken Sandwich is a typically a boneless, skinless, breast of chicken in a bun or between two slices of bread. Take a pan, add 2 cups of water, chicken pieces, salt & chopped garlic into it and boil the chicken till it cooked enough. Drain the cooked chicken and keep aside. When the chicken is cooled enough, take 2 forks and shred the flesh, if any bone is there, take the flesh out from the bone and keep aside. Now beat the heavy cream with a hand beater for 5minutes, add mayonnaise & black pepper and mix well with the cream. Now add the shredded chicken to the cream mixture with a fork. Stir the mixture for 2-3 minutes to mix well altogether. Add the chopped Ice-berg lettuce or cabbage & chopped spring onion to the chicken mixture. Now lightly toast the bread slices on pan or toaster, apply butter or margarine on both sides, put 2 tablespoons of the chicken mixture on one toasted slice, and cover with another. Cut the sandwiches diagonally and serve with ketchup. If you do not want the edges of the breads, just cut them before toasting the slices. If you want, you can add some roasted peanuts to the potato mixture.